Paterson, NJ – Two New Jersey based stalwarts in the printing industry - with a business relationship that extends beyond 25 years - have combined to complete the first U.S. installation of a highly productive dual rotary knife precision sheeter. UNIMAC Graphics, a diversified graphics communications company with a national clientele, purchased the first CPM 1700 from Colter & Peterson, North America’s largest independent distributor of paper cutters and paper handling equipment, soon after seeing the 67” machine in action at Print ’13. 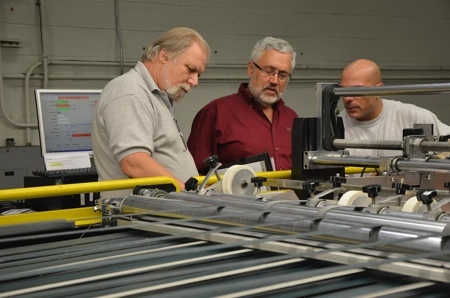 UNIMAC Graphics President Steve Rickett decided to house the sheeter, which cuts up to 1000 feet per minute and is accurate within one-tenth of an inch, at corporate headquarters in Carlstadt. Since being put into operation in March, the CPM 1700 has made a huge impact and exceeded all expectations. UNIMAC Graphics www.unimacgraphics.com excels at offering a smorgasbord of cross media marketing solutions for the commercial printing, pharmaceutical, Point-of-Purchase and packaging markets. The CPM 1700 sets the stage for their 5- to 8-color web/sheetfed presses for offset and digital printing and web inkjet printing in Carlstadt and at their other facility in nearby Clifton, a stone’s throw from C&P’s www.papercutters.com home office. The CPM 1700 has a modular design and offers the newest technology available with Siemens electronics, a feature benefit Rickett recommended to C&P’s Bruce Peterson. It also provides the capacity to develop 57” tall skids with up to 80” long sheets and slitter flexibility. See it in action by clicking this link. Rickett says all of those functions have performed well. He also indicated the reliability of the CPM 1700 resembles that of the paper cutters he has purchased throughout the years from C&P.